One social networking site you may want to use on your Samsung Galaxy Note 3 is Twitter. Twitter is a social networking site, similar to Facebook but with increased brevity. On Twitter, you write short spurts of text that express your thoughts or observations, or you share links. Or, you can just use Twitter to follow the thoughts and twitterings, or tweets, of other people. You can post messages on Twitter and follow others who post messages. It’s a good way to get updates and information quickly, from not only individuals but also news outlets and other organizations. The best way to use Twitter on your Android phone is to already have a Twitter account. Start by going to Twitter on a computer and follow the directions there for creating a new account. After you’ve established a Twitter account, you need to obtain the Twitter app for your Galaxy Note; it doesn’t come preinstalled. Visit Google Play Store and download the Twitter app from Twitter, Inc. When you start the Twitter app for the first time, touch the Sign In button. Type your Twitter username or e-mail address, and then type your Twitter password. After that, you can use Twitter without having to log in again — until you turn off the phone or exit the Twitter app. 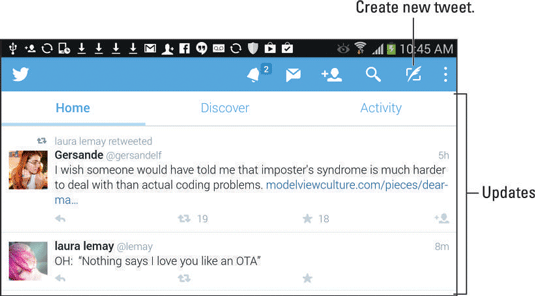 Here is the Twitter app’s main screen, which shows the current tweet feed. To tweet, touch the Create New Tweet icon. 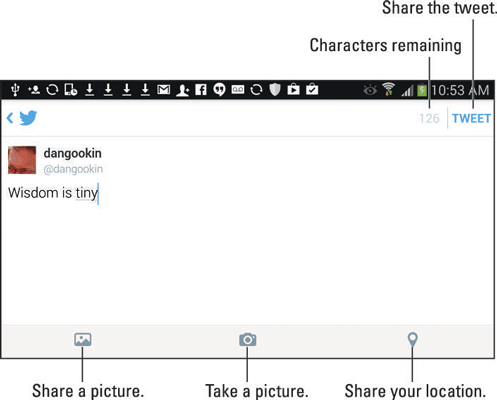 Use the New Tweet screen, to compose your tweet.